Saturday Night Live (SNL) is known for taking on very controversial topics that are hot in the media. This past Saturday they decided to take on the tragedy surrounding the death of 17 year old Trayvon Martin. The comedic sketch show tackled the controversial by doing a spoof of CNN's Piers Morgan show. 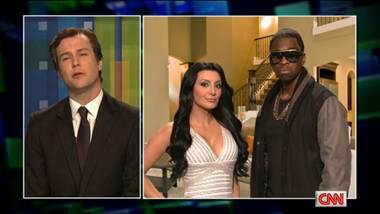 (MSNBC) -- In a controversial skit, cast member Taran Killam reprised his role as news commentator Morgan, and discussed the controversial Trayvon Martin case with a slew of famous figures, including Ozzie Guillen (played by Brolin), West (played by Pharoah), and Kim Kardashian, played by Nasim Pedrad. The sketch had viewers torn. Many posted angry remarks saying tackling the Martin case crossed the line. Others enjoyed the spoof of West and Kardashian, as well as the take on over-sensationalized media. I guess the larger point is slamming Piers Morgan. I think they are creative enough to have figured out another way of accomplishing this.